KB Hallen, Copenhagen 03.09.70 [1st Source aka. "Old Source (Incomplete)] plus Tivolis Konsertsal, Copenhagen 07.01.68; 1st Show / Falkoner Centeret, Copenhagen 10.01.69; 1st & 2nd Show. Files: 11.:: Size: 189.92 MB (mp3) / 505 MB (flac). Personnel: Jimi Hendrix :: Noel Redding :: Mitch Mitchell . Notes: The Cover of this set says Disc 1 is recorded in Copenhagen 07.01.68, but this is wrong. 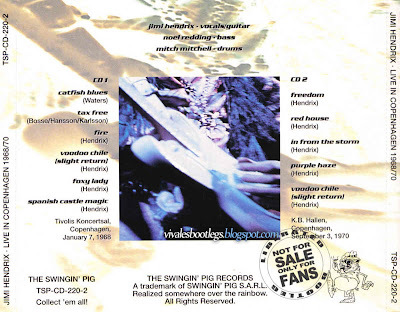 "Catfish Blues" (8) was recorded at Tivolis Konsertsal, Copenhagen 07.01.68; 1st Show, "Tax Free" (12) was recorded at Falkoner Centeret, Copenhagen 10.01.69; 1st Show, and "Fire" (46),"Voodoo Chile (Slight Return)" (40), "Foxy Lady" (52) and "Spanish Castle Magic" (56) were recorded at Falkoner Centeret, Copenhagen 10.01.69; 2nd Show. Disc 2 is correctly recorded at KB Hallen, Copenhagen 03.09.70, but only features about 1/3 of the show. 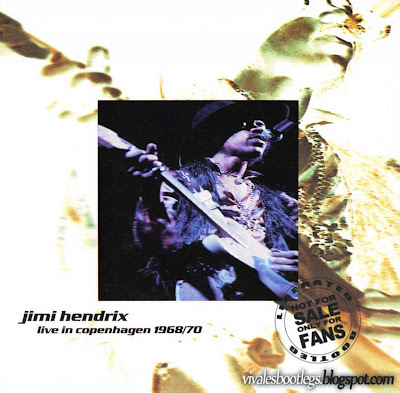 - Disc 1 plus Track 1, Disc 2 of this set is the complete UniVibes CD "Jimi in Denmark" minus the Copenhagen 10.01.69 interview with Jimi, Noel and Mitch by Niels Olaf Gudme for Danish Radio "Afterbeat".<-(Info taken from infromthestorm.net).